COPPELL, TX -- (MARKET WIRE) -- May 4, 2007 -- Mannatech, Inc. (NASDAQ: MTEX) today reported record first quarter earnings of $0.26 cents per diluted share for the three months ended March 31, 2007, up 18.2% from the first quarter, 2006, earnings per diluted share of $0.22. Net income for the first quarter, 2007, reached $6.9 million, an increase of 16.6% compared to $5.9 million in the first quarter of 2006. Pretax profit was $10.4 million, an increase of 12.0% compared to $9.3 million in the same period last year. First quarter net sales for 2007 were $104.8 million, an increase of 5.9% compared to $99.0 million in the first quarter of 2006. Sales growth for the quarter was slightly impacted by the transition to the new ERP system at the end of March. Total independent Associate and Member count based on a 12 month trailing period increased to 553,000 for the first quarter 2007 as compared to 510,000 for the first quarter of 2006. The 8.4% growth resulted from higher retention of continuing independent Associates and Members which were up 73,000, a 25.9% increase compared to the same period last year. This increase was partially offset by a 13.2% decline in new independent Associates and Members on a 12 month trailing basis. Sam Caster, Chairman of the Board and CEO, said, "We are highly encouraged with our progress at the start of the year. The sales momentum that began in late 2006 continued in the first quarter and we were able to deliver solid sales and earnings while transitioning to our new ERP system." Mr. Caster continued, "A number of important initiatives continued to energize our independent Associates in the first quarter of 2007, among them: the launch of our Optimal Skin Care System in the U.S. and Canada; increasing Associate awareness of the benefits of Phytomatrix's all natural vitamin formula; the kick off of our annual travel incentive in January; and record attendance at MannaFest, our annual international corporate-sponsored convention for our independent Associates." *United Kingdom began selling products in Germany in March 2006. Mannatech will hold a quarterly conference call and webcast to discuss this announcement with investors on Monday, May 7, 2007 at 9:00 a.m. Central Daylight Time, 10:00 a.m. Eastern Daylight Time. Investors may listen to the call by accessing Mannatech's website at www.mannatech.com. 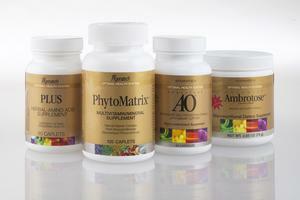 Mannatech, Incorporated is a global wellness solutions provider of innovative, high-quality, proprietary nutritional supplements, topical and skin care products, and weight management products sold through independent Associates and Members located in the United States and the international markets of Canada, Australia, the United Kingdom, Japan, New Zealand, the Republic of Korea, Taiwan, Denmark, and Germany. Please Note: This release contains "forward-looking statements" within the meaning of Section 27A of the Securities Act of 1933, as amended, Section 21E of the Securities Exchange Act of 1934, as amended, and the Private Securities Litigation Reform Act of 1995. These forward-looking statements generally can be identified by use of phrases or terminology such as "highly encouraged" or other similar words or the negative of such terminology. Similarly, descriptions of Mannatech's objectives, strategies, plans, goals or targets contained herein are also considered forward-looking statements. Mannatech believes this release should be read in conjunction with all of its filings with the United States Securities and Exchange Commission and cautions its readers that these forward-looking statements are subject to certain events, risks, uncertainties, and other factors. Some of these factors include, among others, Mannatech's inability to attract and retain associates and members, increases in competition, litigation, regulatory changes, and its planned growth into new international markets. Although Mannatech believes that the expectations, statements, and assumptions reflected in these forward-looking statements are reasonable, it cautions readers to always consider all of the risk factors and any other cautionary statements carefully in evaluating each forward-looking statement in this release, as well as those set forth in its latest Annual Report on Form 10-K, and other filings filed with the United States Securities and Exchange Commission, including its current reports on Form 8-K. All of the forward-looking statements contained herein speak only as of the date of this release.